Showing results for tags 'wonderbolts'. ((OOC: http://www.canterlot.com/forums/topic/21745-the-changing-of-guards-calling-all-royal-equestrian-guards/)) THE POETRY OF THE SUMMIT~By LYIPHEORYIA STERTLINGS* The day was bright and early, Celestia's beloved sun an early bird in the quiet sky. It was all but silent, save for a few ponies' cry. For today was the day, that all might change; that perhaps after today, all enemies would be held at bay. To protect Equestria, Luna and Celestia. To aid in it's citizens and ranks, to keep in peace from every sea, to each river bank, This was the duty that lay ahead, the job forever and eternally -of the Royal Guards. By duty and by service, I summon thee here today. To discuss and to debate, each enemy hailed away. To mingle with Changeling minds; to delve into Chaos' soul. To fight against Tirek, To battle against each and every villain, that has dared to seek his eyes upon Equestrian. Today is the day, that all victories shall lie nigh, For today is the day, that the Royal Guard shall pay, its homage-to their liege Equestria. *As events unfold themselves in the summit, more verses shall be added. It was not often that Wordsworth Psmith, of the Canterlot Psmiths, traveled alone. When he traveled for work, he accompanied Prince Blueblood as a confidential secretary and social advisor. When traveling for pleasure, he preferred to bring a friend or two along. Unfortunately, the only window of time when his boss could allow him some much needed vacation time did not coincide with any holes in the schedules of his list of friends and acquaintances. But, such were the vagaries of life, and as he would always say, "Such things are not to be complained about with idleness, but endured and triumphed over, with whatever means or allies come to hoof. The strategist is ever the adaptist...." And he would then go on like that for a full ten minutes or so. Regardless of whether anypony was actually listening. The upshot of it was, he threw a dart at a map, and as a result had booked himself a first-class ticket on an airship headed towards Saddle Arabia! Not that he hadn't been aiming for the place; the culture of these strange, southern Equines had all the fascination of the exotic, and had even informed his last Nightmare Night costume. 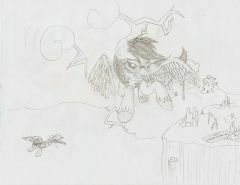 And, for somepony as talkative as himself, the notion of a country that was practically rules by debate made him feel as if he would be coming to a kind of Utopia, or at least a home-away-from-home. Which brings us to the present, where the young unicorn stallion was elegantly draped over a deck chair, monocled eye scanning the horizon while active lips pontificated to the empty air. "Solo travel brings with it freedom, the soaring of the lonely eagle is constrained by no considerations save those in his own head. And yet, does the eagle find joy, or melancholy? Do we not all gladly pay our liberty in coin for society, as one would pay a bit for bread? What is the meaning of this strange adventure we call civilization, if it is not that?" So Radicool! Another week and another episode with the adorable ponies we all love! This week we get out first Rainbow Dash focused episode. From the title one can quickly determine that she gets a new, rather unfortunately nickname along with her new position. How and why? And how will this rookie ribbing affect her self-worth? Will this be an episode where we learn all sports stars get quirky names and accept it because its all in jest and part of team bonding, or will it be one of those 'after school' episodes about name calling and hurting one's feeling? Let's hope for the former! Tune in to find out! The episode airs Saturday 11:30 AM EST on May7th! This thread is dedicated to discussing the episode before, during, and afterwards. As the thread is now open it may indeed contain spoilers. I ask that potential spoilers talked about or shown before the episode airs stay within the spoiler tags please, after the episode you no longer have to use the spoiler tags, but warning, if you haven't seen the episode yet after it airs, this thread no doubt will have all sorts of spoilers in reviews, images, etc. So tread at your own risk. It is that time of the week again when we all huddle around our computers and televisions and watch adorable ponies do adorable pony things. In this week's episode, Rainbow Dash is moving forward with her dream, but some egghead requirements stand in her way! :! : How will see overcome? Will she join the egghead side? Well, find out more in just a few hours! Please discuss the episode, but remember to keep the spoilers in the spoilers bracket. Episode airs Saturday 10:30 AM EST on April 5th. Yes Rainbow Dash, we have decided to start a new rock group! The Village Ponies! Welcome to The Third and Final Chapter for The Academy (Open to join) 2 Years Have passed since the Battle of the Skies at the Academy. The Wonderbolts had arose triumphant against the Shadowbolts, They had a Goal to Bring back Nightmare moon and Bring about Eternal Night with the use of a gem that Spitfire had purchased for defence of the Academy. The Academy had taken a large toll and lay in disrepair and disarry for 3 months after the event. Many of the Graduates of the Final test had been impored by Celestia to Join the royal guard and make the SERS (Stratiegic Equestrian Responce Squad) In order to watch for the Shadowbolts once more. It has been 2 long years and not one trace of evil has been seen in a long time, it seems that they had finnaly been defeated. Or so it seems. Start The sun had risen above Canterlot, The large city lay quietly on the mountainside Watching over The lands below. In the royal district of the city however many guards were bustling back and forth, Shifts changing, Guards going to bed, Guards giving reports about their patrols. Nothing was out of the ordinary for them except the presence of The SERS that had joined awhile back, most had thought that Velocity and Shimmer were foolish for brinning wonderbolts of all things to become guards. Most had even picked fights with the members of the squad, Celestia Tried to keep them under control but a underlaying mistrust still waned between the two groups. Thy sky Raptors had returned with a squad and had trained and watched over the SERS, They watched their talents grow with each day. They are now The 2nd most Elite guards in the city under the Supreme guard. Flashbomb lay on his cot sleeping after a very long day yesterday of training and hard work. So yeah, I was perusing my Facebook and one of my friends found this lovely article. https://medium.com/war-is-boring/1ce5ba1c074b Air Force Bronies are officially a real thing. Flying is Magic it seems. Though the patch should be closer to something related to the Wonderbolts imho. From the album: Frosty's Art and Characters! "...and then the handsome Prince flew up the side of the tower, and rescued the princess, and they lived happily ever after" said the pegasus as he carefully closed the book There was a variety of sounds from around the room as the various foals clapped, cheered, or banged on hoof on their beds if another one was in a cast, a few who were unable to even do that smiled broadly Lightning Streak mirrored that smile, he loved watching the foals face's light up when he read them a story, it was always a rewarding experience, possibly even more rewarding than flying in the wonder bolts themselves was. A "hi" from the Wonderbolts! About Myself: I am How I found Canterlot.com: I was very interested in the show, and I decided to invest time in a forum. How I became a fan of MLP:FiM: I just saw it once and I was hooked. My favourite main cast pony/s: Rainbow Dash Hey! My name is Soaren. I'm not sure if anypony has seen or heard of me, but I'm sure everypony has heard of the Wonderbolts! Yep, Spitfire and I are doing well and we actually just finished a show a few hours ago. I just wanted to check in on this forum and see how everypony is doing. I would be thankful for any replies! The city in the sky was always busy, people were always going and coming... and while it was not unexpected to see some silly pegasus foal flying around doing stunts, it was rarely welcome... When a fully-gown stallion was zipping around, nearly colliding with other ponies right and left, and laughing about it... of course at the same time, Streak had been doing this since he was old enough to fly, so it also had become a fairly normal occurrence. The residents had hoped that his new career would keep him away from the city... they were wrong... Streak zipped forward and made a mid-flight 'hop' over a cart, startling the driver who though the foolish flying pony was about to crash into it, but then he saw who it was and he just rolled his eyes. they had all give up getting angry about streak long ago... The pegasus did a reverse-corkscrew going upwards along a tower and zipping off, flying over the rainbow pools, leaving tiny ripples going all through the colors, making lovely swirls in places before the settled back down. The pegasus finally came to rest atop the dome of the weather-center, surveying the land of clouds. He loved to travel, but it was always great to be home. A very......strange request, so to speak.